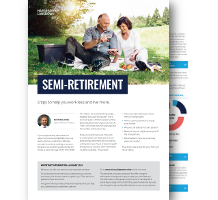 If you’re planning to reduce your hours, set up a business or start studying before you retire, our 5 semi-retirement tips could help you work less and live more. This guide isn’t personal advice. What you do with your pension is an important decision that you might not be able to change. You should check you're making the right decision for your circumstances and that you understand all your options and their risks. Drawdown is a higher risk option than an annuity. The government's free and impartial Pension Wise service can help you and we can offer you advice. The value of investments can fall as well as rise so you could get back less than you invest.